We have a few hours before our two guests for the first weekend out arrive, Francesco and Eliane. We’ve been sailing together previously, and are very happy to have them along for this very special occasion. Ever so much more, as they will be married this summer, and we can’t join them on their special day as we will be sailing the charter yacht Nausica in the Cyclades then. Having settled in a bit and got used to the idea of her being our own boat, we set about to prepare the boat for getting underway. René has left Lindarella for us in a wonderful state, and there are only a few things that need attending to before setting out, including exchanging a broken split pin in the port shrouds that our surveyor had pointed out in the pre-purchase survey this spring. Even though we have only a few items on our list, we realise quickly that we have to adapt to a new and slower pace – everything takes quite a bit of time, and even more so when you don’t quite know where everything is stored, and where to find a specific item in the generous set of spares and tools we have inherited from René and Linda. Not quite as ready as we would want to be we welcome Francesco and Eliane. In the heat of midday and after having a pizza to give us strength we head off for a shopping trip to the local supermarket that does deliveries to the marina. Later than expected we finally decide to head out into the bay to have a test sail, mount the sails, test manoeuvring and handling her, even though we won’t be able to reach an anchorage that night. Being used to very nimble and light charter yachts, we are still surprised by how slowly she gathers way when manoeuvring her out of the berth; halfway to the entrance of the harbour we realise that we simply don’t have enough power on the prop. The engine revs stall at about 1800 RPM. Most likely cause: a fouled prop… after only a month in the water. Albeit knowing that the harbour in Cagliari is a fertile ecosystem in itself, we hadn’t expected the propeller to be so badly fouled in just a bit over a month after taking her out of the water and having her pressure-cleaned for the survey. We decide to turn back into the marina, not wanting to overstrain the motor on our first outing, and not entirely sure whether or not we have identified the cause. We are comforted by a splendid Pasta Carbonara for dinner by Francesco and Eliane and watch the file of flamingos passing over our heads as the sun is setting in a flaming spectacle over the distant hills. The diver comes the next morning, cleans prop and shaft – and indeed it was full of barnacles! As is the log, but we forget to ask for it to be cleaned too. We test the transmission in the berth while still being tied on and sure enough, she squats down like a thoroughbred horse being ready to jump off! 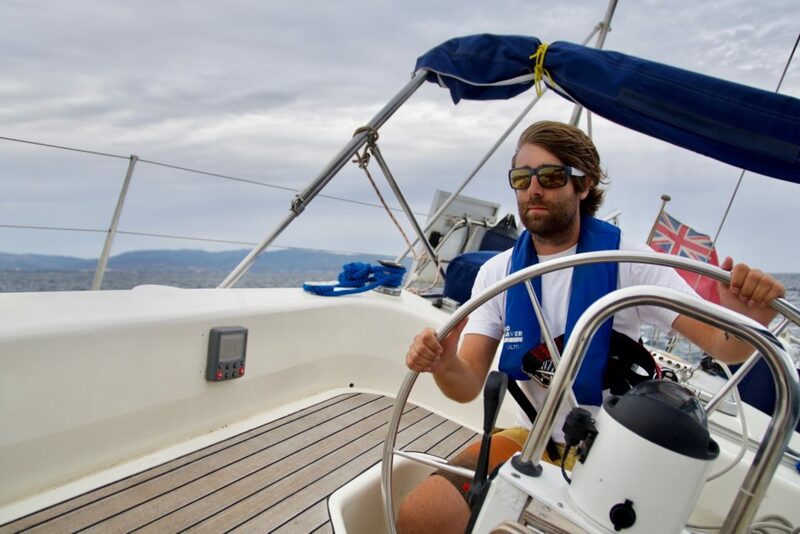 Alex is our skipper of the day, and given the prevailing winds, we decide to head East towards Capo Carbonara to anchor off the East side of the headland. 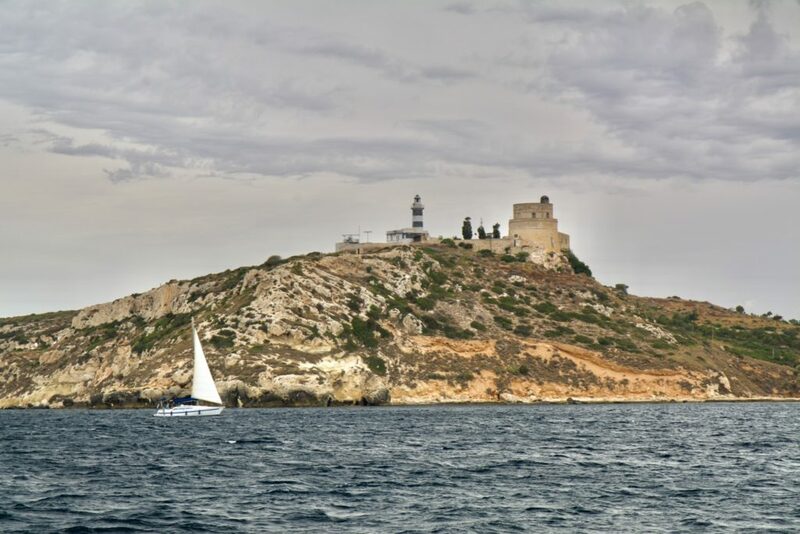 We pass between the headland and Isola dei Càvoli. We come in early, have a swim, and spend a beautiful evening in the bay while the wind dies down. Maybe we should have saved the Pasta Carbonara for tonight? 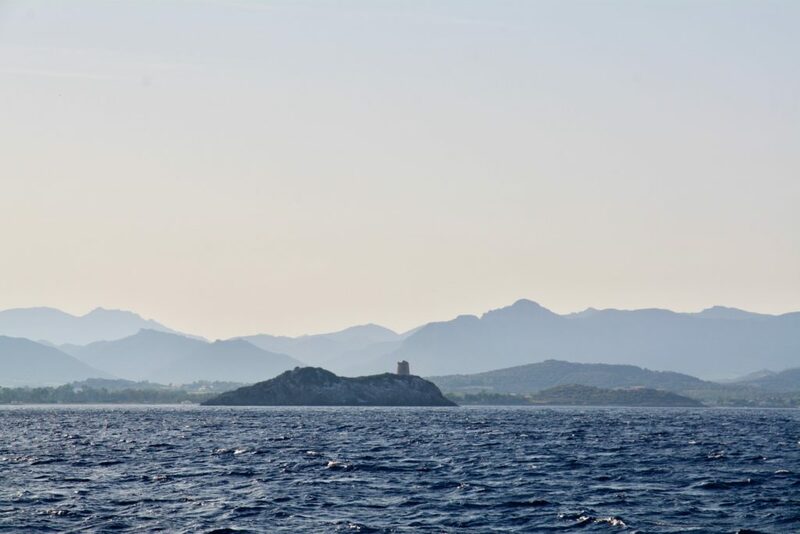 Francesco is our skipper for the next day, and we decide to cut across the Gulf to Capo di Pula. 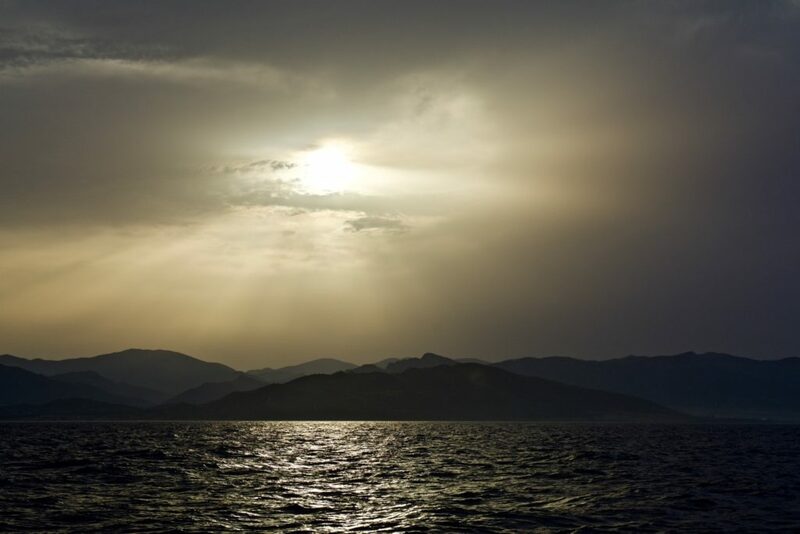 We spend a pleasant sail across the bay, even though we notice that the wind in the bay has a lot in common with those patterns we have encountered when sailing on Swiss lakes – not only can it be very variable with respect to its direction – we have had it changing by 180 degrees within a few minutes – but also its strength varies considerably. The thermals certainly do have a significant influence. 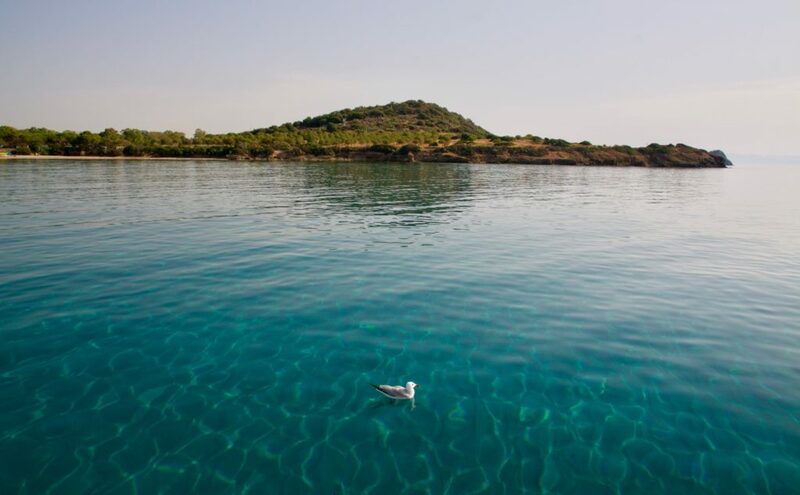 We find a snug anchorage in the northwest corner of the bay North of Capo di Pula. The anchor digs into a deep sandy bed. The water is as clear and turquoise-green as a Swiss mountain lake. The next morning we wake up to a clear blue sky again and decide to explore the land, check the dinghy and the outboard motor under the unforgiving sun. Simply moving about the boat seems a big effort in the morning heat, never mind inflating the dinghy, or moving about on land – we help ourselves with a few dips into the clear blue water. Sure enough the outboard motor gives us a few headaches going to and fro … most of our troubles can mostly likely be attributed to us as inept operators. The manual on board helps us to go about the troubles in a systematic way and gets us going. Nonetheless, it fools us again on the way back and finally cutting the fuel supply seems to do the trick – we have probably swamped it in our numerous attempts to start it. The dinghy is a chapter in itself, and certainly not the easiest to steer – it likes to go sidewards as much, if not more, than forwards. This first experience with the dinghy reinforces our wish for a more solid, rugged, and directionally stable dinghy. 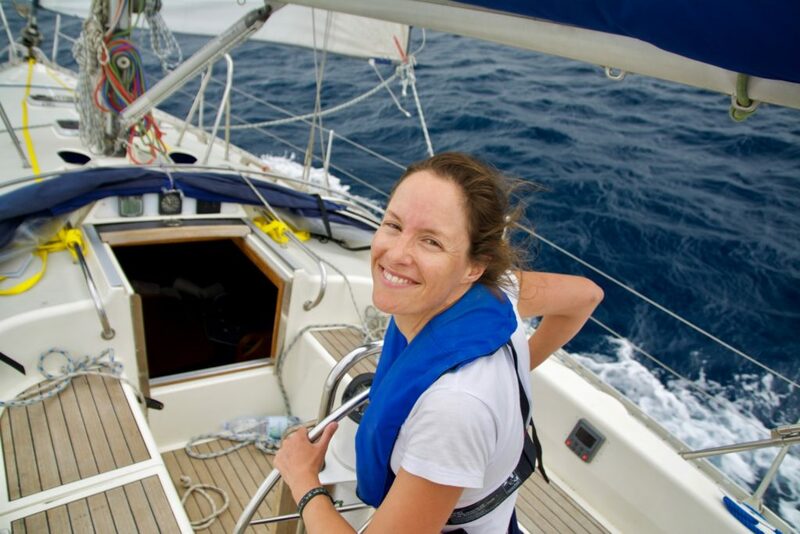 Eliane is our skipper of the day and brings us back to Cagliari safely. We drop the sails as we head in and our first weekend out with our lovely guests slowly draws to an end. We indulge in a hot shower before we head out for ice cream and pizza in town. We wake up to some rambling noise on deck – our first guests are leaving us early in the morning to catch their flight back to Switzerland. For the first time, we will be alone on our boat. After having a slow morning and getting ourselves sorted again, we head out again towards the South. We decide to go back to Capo di Pula despite the head winds; we want to find out how close she can lie with her current sails and to see her trim. Moody 376 are known to list to port – all the heavy stuff is there – the cockpit locker, the galley, a lot of storage area. Just how bad we had no idea of: on port tack she lies as close as 30 degrees to the wind, while on starboard tack, she only does 60 degrees. Maybe the wind instrument is out of tune on top of it, but this is certainly an issue we want to think carefully about. As we slowly work downwards to the South we get closer to the anchorage of the big tankers unloading at the refinery. I’m down below when we get hailed over the radio from ‘Rainbow‘ a few miles away on our starboard bow. They tell us that they are just getting underway shortly and rather quickly and ask us to move out of the way. Assuming that we are on a collision course, we first put in a tack, and observe the situation, both on deck, and down below on the AIS. Soon we realise that we’re just continuing in their path and have to head back downwind towards Cagliari to avoid them. Just as we bear away and put in a gybe to avoid running too far to the East, the wind fails us and we decide to put on the engine to get out of Rainbow‘s way. She’s approaching very fast and without our avoiding action we would have been right on spot to meet her giant bow. As it is, we are a safe distance away and watch her race by. The detour probably cost us an hour, and we have lost quite a bit of ground we had gained earlier. Meanwhile the sky has turned a shade darker, and the sun is slowly disappearing behind a veil of cirrus clouds. 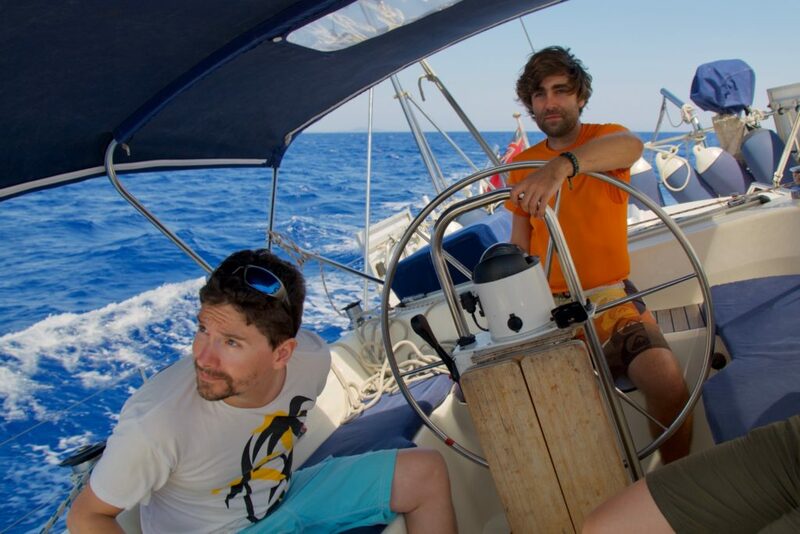 We reassess our position and the estimated time of arrival and discuss whether to carry on tacking upwind or head back to Cagliari. After a bit of consideration, we decide to carry on, more so because we have been in the same anchorage before and have a good idea of where to drop the hock. A quick dinner on the way sets us up. It’s a marvel which difference a full belly makes on a person’s wellbeing and stamina! When we arrive to the last of the sun’s rays, we see a flock of yachts and catamarans all anchored in the southwest corner of the bay. 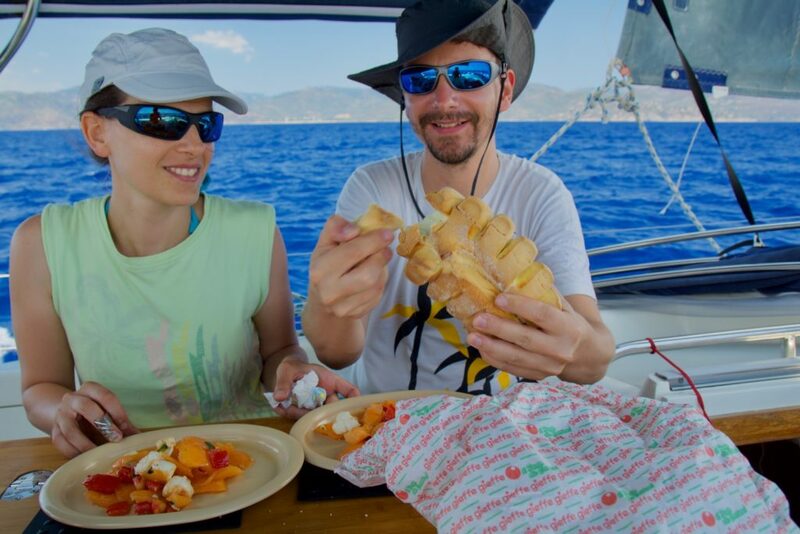 Our pilot guide advises to tuck into the northwest corner, and that was exactly the spot we have been in with Eliane and Francesco two nights earlier and have seen the anchor dig in so deep we couldn’t even see its flukes anymore. We asked ourselves the inevitable question of the late-comers: (1) do we stay with the crowd, seemingly safe (with the potential logical fallacy of ‘surely they know what they’re doing‘) or (2) do we do our own thing (while wondering ‘why would we assume our judgement is any better than others’?’, and ‘did anybody else maybe just follow the first boat, see (1)’)? We decide to trust the weather forecast that promises thunderstorms with strong gusts from the North overnight, our pilot guide, and our gut feeling and go anchoring by ourselves in the opposite corner. We put out a scope of 40 m of chain with an additional snubber in just 3.5 m of water to make sure we will have enough chain down to keep us there in strong gusts, and set the anchor with enough revs in return to make us feel happy. Meanwhile it has become too dark to go and dive for the anchor, but it had bitten straight away so we are confident it stays. While we set about settling down for the evening with a glass of wine, we lie in the southerly swell that wraps around the headland and hits us beam on. 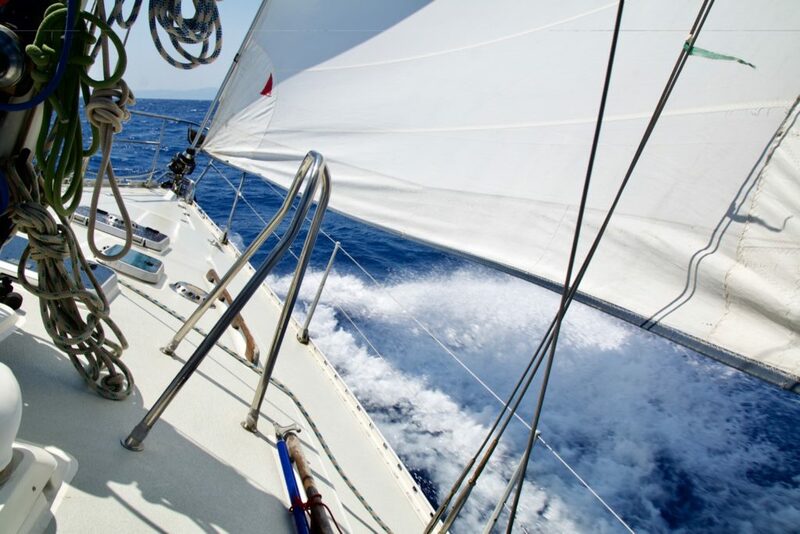 We discuss the merits of a riding sail that would keep us nose to the wind, and in this case, stern to the swell, and also about setting a stern anchor. Equally, we start doubting our decision to stay away from the crowd, wondering whether they will have a calm night at anchor while we will be shaken like James Bond’s martini all night. Watching their anchor lights describe the same infinity symbol ours does, we see that the conditions over there in the South are just the same as ours, the swell wraps around the headland; and we are happy with our decision to stay away. 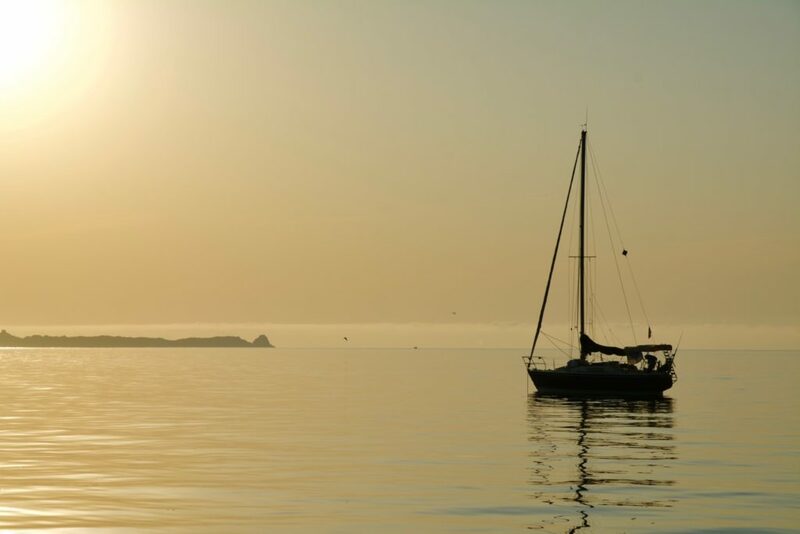 Being away from the crowd does not only mean that in case of our anchor dragging we will be free to leave in an instant without having to negotiate between other boats and their anchors, but also if another boat’s anchor would drag we are far away from the harm they might inflict. It is hot that night and I have troubles sleeping, being squeezed in between Alex and the hull in our narrow bunk. Some time towards the early hours I decide to move into the salon and sleep on a bunk there. 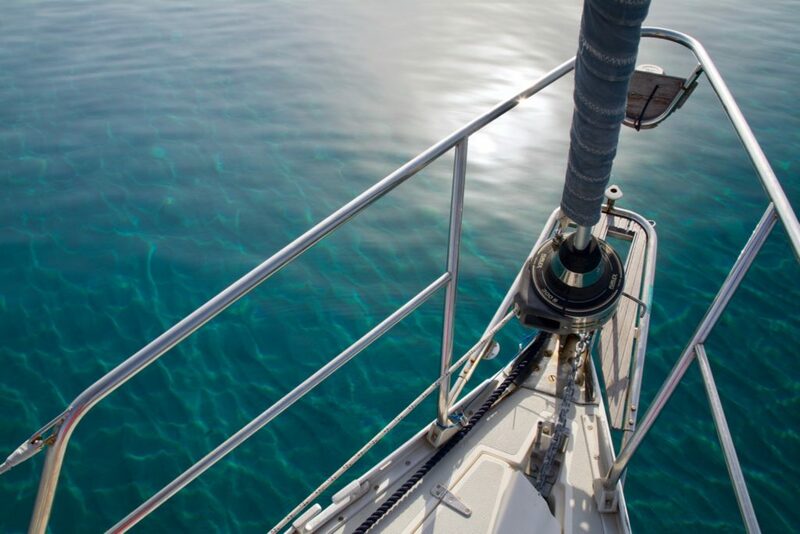 I wake with a sudden start when the humming in the rigging takes a new sound, I listen to whistling and humming, I feel the vibration of the rigging being transferred into the boat’s hull. Time to go and check up on deck! When I come on deck, a hot gust slaps my face. From South! Not quite what we have expected – the forecast promised Northerlies in the night – and not exactly what we would like when hanging about in the north-westerly corner of a bay, rendering it a lee shore. I watch the water surface in the light of my torch, and see the flags on the stays flap wildly. I want to check we are still in the same spot as before, and I turn on the instruments and grab the bearing compass to verify our bearings of last night. As I come up and look at the wind instrument showing a gust of 88 kts (Beaufort 12 – Hurricane-force wind) I don’t believe my eyes and wait for it to get to a more sensible reading. Up to the date, I am certain I have seen this number – and steady 78 kts a bit later for a longer period – but we are quite sure the instrument must have given an incorrect reading at the time. The bearings look kinda fine, even though one of them has changed quite a bit, but still not to such an extend that I would be worried given the distance to the spot, the amount of chain we have out, and the wind direction. I fight with myself whether to take a photo of the wind instrument’s numbers, or do the sensible thing of checking the anchor and being ready to get underway should it drag. The sensible part of me does win, and I try to get Alex out of bed while searching for a hair band to keep my hair together out in these scorching heat blasts. I walk to the bows, making sure I have a good hold onto the ship, I am not sure where the next gust will come from and how heavy it will strike. Most of them fall from above and press down on me; they are scorching hot and laden with red dust. I check the anchor chain and I am relieved it doesn’t show any sign of moving. The boat swings to her anchor, and the snubber is under great tension, the chain extends out far forward at a reassuring angle. We are glad and thankful we have reduced the boat’s windage as much as we could before we went to bed, and tied down the rest, lashed the headsail twice such that it can’t get blown out should the furling line fail. We stay awake until the storm has passed, and when the wind reduces we jump back into bed. What an adventurous start to my birthday! We decide to head back into Cagliari for the following night to celebrate my birthday with some ice cream and to tackle some repairs. Somewhere along the way one of our mainsail’s mast cars breaks. Getting in and out of the marina still involves a bit of adrenaline, especially with a boat that we don’t yet know and with a berth that is not the easiest to get into or out from. As we head back into the marina the wind is up to a steady Beaufort 4, gusting 5, blowing straight into our berth; we called the marineros as we came into the harbour, and they’re waiting for us at the pontoon to hand us our lines. 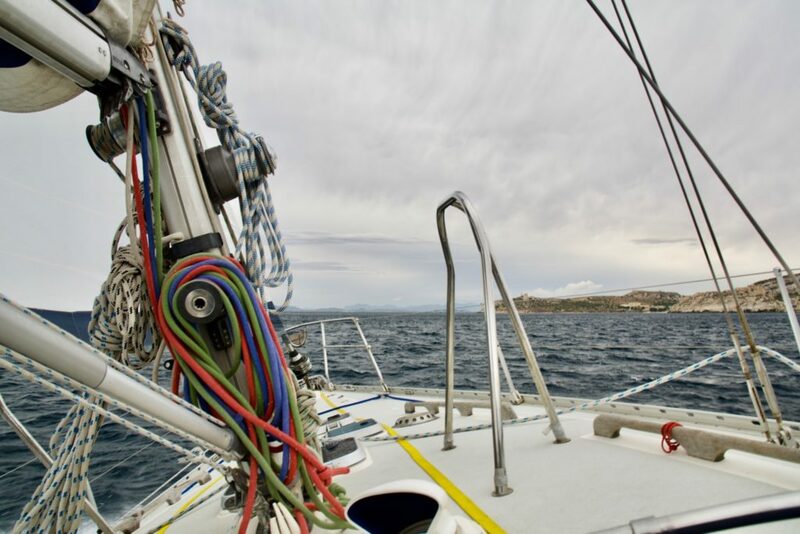 In order to get into our berth we have to do a little S-turn – not the easiest in any case – and reverse downwind into the berth as it is – having to approach downwind does not make life any easier! I am far from knowing the boat and how she will behave, even though I do have some ideas and can anticipate a bit what she is likely to do. I take my time and test how she reacts when I put her into reverse boldly; she needs a while before she comes up and reacts to the rudder. I make myself a lot of room, immensely grateful for the advice we have received from Peter Lightfoot, our RYA Day Skipper trainer, Paul McNeil, our RYA Coastal Skipper trainer, and keeping in mind how Jürgen of the neighboring boat has handled her when getting to and fro the crane for the survey. As I go past some other pontoons, I take a deep breath, notice some other people sunbathing on deck of their boats with a bit of envy, return the greeting of a friendly gentleman who is sat fishing on the pontoon of the neighboring marina and smiles at me reassuringly, gesturing me to keep calm and take it slowly. I put her into reverse and start my approach. Conscious of the extruding bowsprit of the boat opposite our berth I approach our berth with quite a bit of speed to counteract the wind acting on the hull. I get her in alright, give a good burst forward and we are perfectly snug back in our berth, taking the lines from the marineros. I can’t believe how smooth it all went. Smelly as we are, we hop onto the bus to get to the beach and grab some ice cream after making sure the boat is happy enough in her berth. We decided to reward ourselves rather than going for a shopping tour to get the material for tackling the repairs – a decision we’re likely to regret tomorrow, but we really need some space to ourselves. We hope to quickly get our repairs done and be out again sailing. Well, hardly anything ever goes quickly and smoothly in the marine industry as John, our surveyor said a while ago. Everything takes a lot longer than expected and later in the day than expected we wonder whether heading out still makes sense. We decide to stay in the harbour today and use the time to work on our todo list that is continuously extending. With boats, todo lists grow with such a speed that you can’t expect to ever reach their bottom. After a good day’s work we decide to use the time for some manoeuvering practice in the marina. The next morning yet another nasty surprise awaits us: the daily engine check reveals water in the pre fuel filter, 18 mm of it! Will we spend yet another day in the marina trying to figure out the problem? 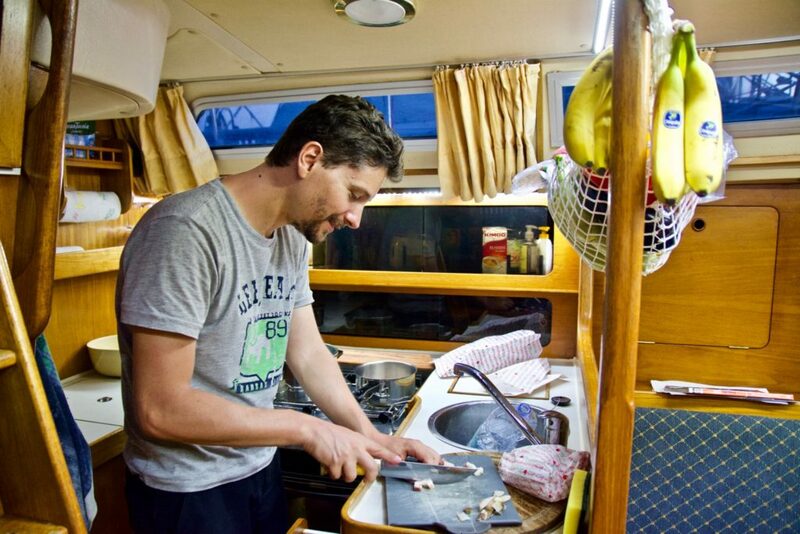 None of us fancies that and after we have read up on the problem and our engine, we bleed out the water from the filter, decide to monitor the situation, and head out for a day sail to Capo Regina on the eastern side of the gulf. 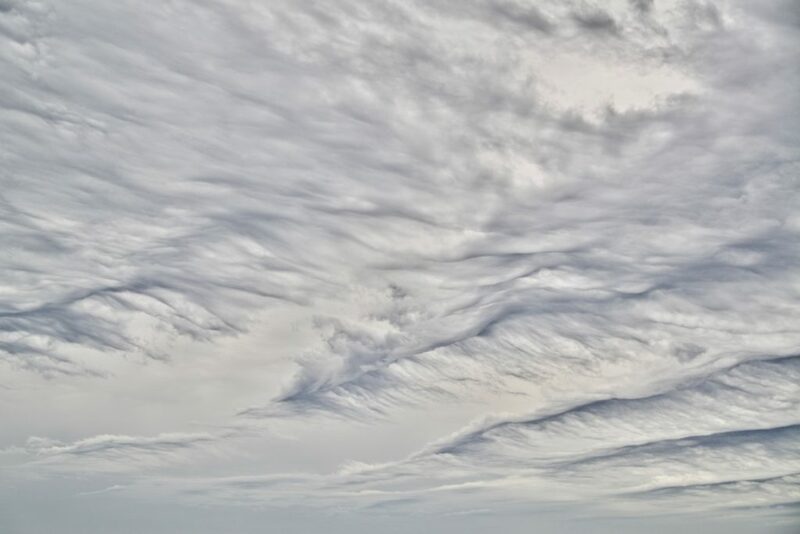 What a beautiful day with peculiar clouds all over the place. The wind picks up and we reduce our sail area, put in a reef. Given the wind direction we decide to give up on Regina after a while and decide to head back into Cagliari to leave enough time to get her ready for leaving her tomorrow. As we round Capo St Elia a sail with the Moody Owners Association’s logo on catches our attention: the Moody 41 Bob on their way into the harbour! We tack up the bay together, and the time flies by. We assume Bob deliberately gives us a chance to keep up with them ;). Yet another small boat joins our little ‘regatta’. Some define a regatta or sail race as two sailing ships with their sails up within sight of one another. At the harbour entrance Bob heads in while we throw in two more tacks before getting the sails down in the harbour basin and heading up to the fuel berth in the far western corner of the harbour. We cannot see anybody attending the fuel berth and don’t reach a soul on the VHF, so we make a slow circle in front of the pontoon to observe the situation and decide what to do. A German catamaran boldly dashes by directly in front of us, screaming over to us ‘It’s open!’; not polite, but what the heck, why bother. When it’s our turn, we convince the gentleman at the fuel berth to take the water-diesel mix we have taken out of the fuel filter, leave some tip and head back towards our berth. 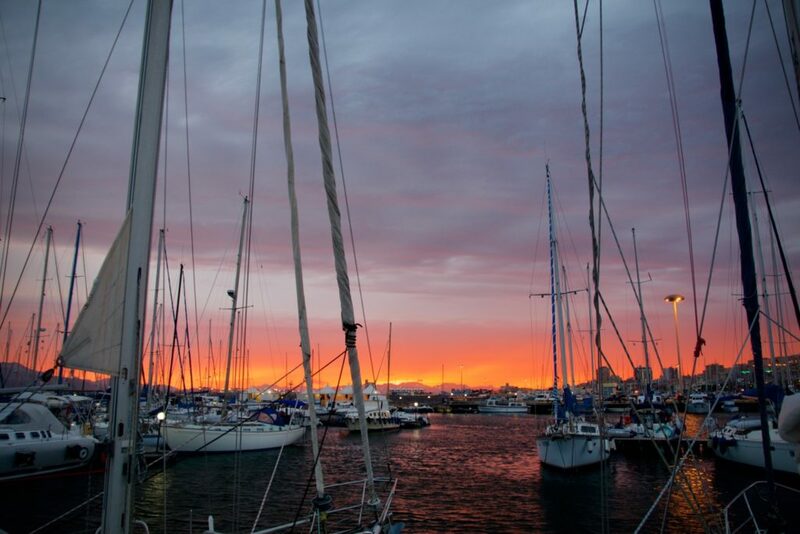 Our friend Anita is in Cagliari for a few days before heading north to go sailing in the Maddalenas for a week, and she will be coming to the marina shortly to meet up and see our beautiful new boat. Before meeting up, we just have time to make the boat halfway presentable, but run out of time to do the same for ourselves. 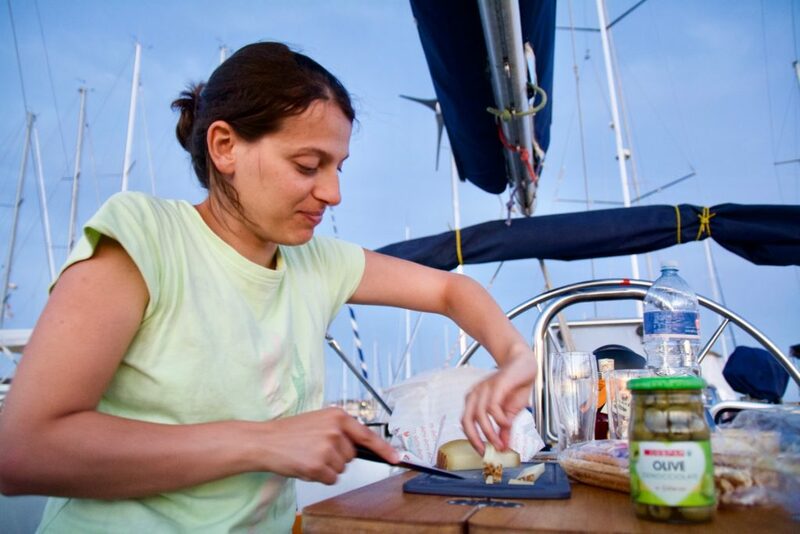 The next day is taken up with preparing the boat to leave her on her own devices. There are so many small things to do to get her ready, and each takes just a bit longer than we thought. The day flies by in a rush and we don’t manage to do some of the other tasks not directly related to leaving the boat, such as taking measurements for the new name on the stern. We say goodbye to Lindarella and hope she’ll take good care of herself until we come back for Alex’s birthday the next month.